The Band’s Visit proposes that no matter where you are in the world people are more alike than different. Overworked wives are irritated by unemployed husbands. Men desire women even if they are bad at articulating it. Loss and sadness can be carried for years. Jealousy, lust, longing, and romance cross boundaries, cultures, religions, and language. Despite this gentle exploration of the unexamined lives of ordinary people, I resisted this new musical’s charms. It is a strong production, tightly directed by David Cromer, astutely designed by Scott Pask, with a vibrant score by David Yazbek. But this brisk unexpected journey to an Israeli town in the middle of nowhere never tipped into the sublime. 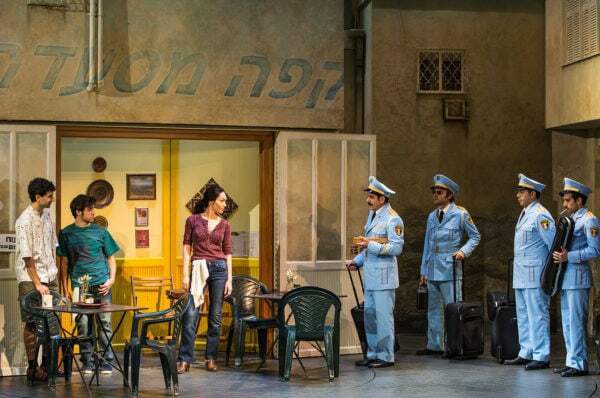 The Band’s Visit can certainly be celebrated for its Middle Eastern representation and putting forth a story of the Middle East not centered on warfare or conflict. The musical written by Itamar Moses is based on the 2007 Israeli film (screenplay by Eran Kolirin) of the same name. It involves an Egyptian Police Band who are on their way to perform a concert and end up in the wrong town in Israel. Over the course of one night in a sleepy hamlet, the musicians meet the locals and moments of kinship and connection are made. Central to these interactions is Dina (Katrina Lenk), a sultry cafe owner, who finds the band members places to stay, invites a few into her home, and insists on a night on the town with the band’s leader, Tewfiq (Tony Shaloub). They spend the evening wandering the meager sights of Bet Hatikvah and talking about their pasts, desires, and dreams. As they make their way through town, we meet others like them yearning for something else–a young man wishing he could talk to girls, a young man waiting on a phone call from a long-distance love, an old man missing his late wife, a young couple seeking their lost romantic spark, and a reserved man composing the concerto in his heart. Despite a fine cast and an unusual Middle Eastern inflected score, these quiet interactions have a repetitive familiarity to them. For a show that is partially in Arabic and Hebrew, it also feels strangely denuded of specificity. The ordinariness never becomes extraordinary with keen observations or finely shaded details that make these characters of a place or time or nature. The focus of almost all the conflict is the exact same kind of longing for love and so each dramatic moment is equal to the one before it and after it, making few beats stand out. In my boredom over the same-y-sameness of all this generic “wanting,” my mind wandered. Like many, I marveled at Katrina Lenk’s sensual and magnetic performance, but I was disappointed in the story options for the other female characters–a sullen wife (Kristen Sieh), a sullen young woman, and an ardent young woman. Only Dina’s inner thoughts get voiced while the rest remain objects or obstructions. It’s a 90-minute show and so there is no time wasted on fleshing out these female characters. Yet several smaller male characters get songs about themselves. You’ve got three narratives about lonely Israeli men alone. One way that might have made the nature of the narrative more dynamic or varied would have been to, and I know this a radical idea, give more women speaking parts and songs. Perhaps we are meant to be satisfied with the garrulous Dina. She’s certainly a female character with agency. But it’s hard to throw a rah-rah parade over this sliver of solid representation. Kristen Sieh, as the miserable wife, Iris, has some dialogue but I wanted to know more of what her character was thinking, why she stays with her layabout husband, and where does she go when she storms out of the house. She makes the best of her limited material but we’re left wanting so much more. Is someone worried that two women’s stories in one musical might just tip the balance and a toxic cloud of narrative estrogen might overpower the entire endeavor? I know a critic’s job is to assess what is in front of them and not re-write a show to their own interests. But what happens when all you can see are the voids and absences? I feel like a crank. Why can’t I just be ecstatic with a musical performed partly in Arabic and Hebrew. Why can’t I just be satisfied with casting performers with Middle Eastern backgrounds in the roles of Middle Eastern characters. Why can’t I just celebrate a central female character in a Middle Eastern focused musical. Because I want more. I cannot help myself. These are all wonderful and necessary steps forward for Broadway and my frustrations do not diminish those achievements. But also, we don’t get progress handed to us. We have to ask for it. So I’m asking. Please sirs, can I have some more ladies. Cast includes Katrina Lenk, Tony Shalhoub, John Cariani, Ari'el Stachel, George Abud, Etai Benson, Adam Kantor, Andrew Polk, Bill Army, Rachel Prather, Jonathan Raviv, Sharone Sayegh, Kristen Sieh, Alok Tewari, Pomme Koch, Madison Madison Micucci and James Rana.